Australian filmmaker Mark Savage has always been an overlooked talent in the arena of shoestring budget horror cinema. His films Marauders (1986), Sensitive New Age Killer (2000), and Defenceless: A Blood Symphony (2004) have always been personal favorites of mine since getting them on DVD years ago from the now-defunct Subversive Cinema. They’re gritty, violent, and artistic films that carry a strong “violence is an ugly thing” message in their approach to onscreen violence and brutality and carry some elements of old school gritty cinema from the likes of Sam Peckinpah while discarding the new polished “Hollywoodized” grindhouse treatment seen in contemporary works from the likes of Tarantino and others. “Savage Sinema from Down Under” (as the DVD box set from Subversive Cinema is called) is something I always spoke highly of as I’ve recommended his works to fellow underground horror and gore cinema fanatics. Greater recognition of his work has started to pick up over the past couple years with the release of Stressed to Kill (2016) starring Bill Oberst Jr. and Armand Assante. This review will take a look at his latest release, Purgatory Road, which comes to us on Blu-Ray from Unearthed Films. 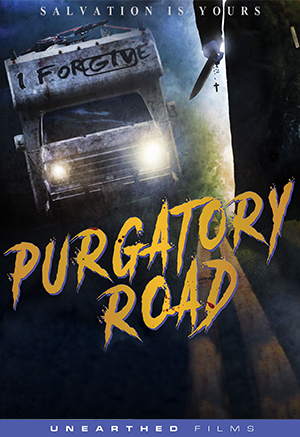 Purgatory Road takes the approach of old school ’70s religious-themed horror flicks as it tells the story of a priest and his brother on a mission to cleanse people of their sins. The two brothers experienced trauma as youngsters. Driving across Mississippi in their RV which they have made into a confessional-on-wheels, Father Vincent (played by Gary Cairns) takes to viciously killing folks who he deems have committed the most egregious sins while brother Michael (played by Luke Albright) helps him with disposing of the bodies. 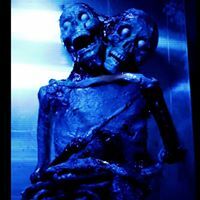 The two on their journey eventually cross paths with Mary (Trista Robinson), a woman who turns out to be just as psychotic as Vincent and willing to help them kill on the path of vengeance. Michael slowly begins losing his willingness to be Vincent’s accomplice. This creates a tension among the three that eventually leads to their mission’s unravelling. Purgatory Road is an awesome old school-style horror flick which delivers in gore and brutality and has the vibe of many older films in the “psychotic priest” subgenre. Savage has Marcus Koch on board doing the film’s gore FX which are plentiful as you get the guts and dismemberment expected of the genius behind 100 Tears, American Guinea Pig: Bouquet of Guts and Gore, Bloodshock and Song of Solomon. Koch (along with TOETAG’s Jerami Cruise) is quickly becoming the gold standard-setting kingmaker for modern make-up FX artists.